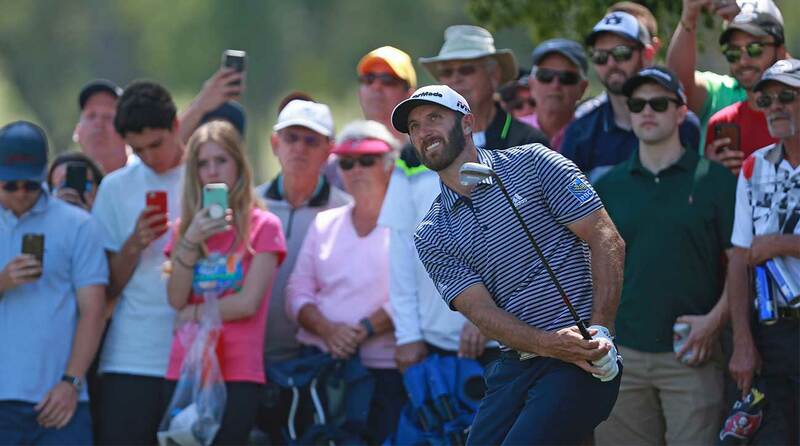 Dustin Johnson worked his way into position at the Valspar Championship on Thursday through Saturday, but he did little to help his cause on Sunday. The World No. 1 never truly threatened and signed for a three-over 74 to finish in a tie for 6th. An ever par round would have been good enough to force a playoff with winner Paul Casey, who shot 72 and beat Louis Oosthuizen and Jason Kokrak by one. Johnson played in the final group with Casey and was one off the lead to start the day, but he turned in his first birdie-less round in 17 months. Dustin Johnson made three bogeys and no birdies on Sunday at the Valspar. Johnson gained strokes versus the field on the greens in each of the first three rounds, but he lost .683 strokes putting in the final round. His Sunday putting performance ranked 46th among the field, yet he still finished 14th in that category for the week. He made just 46 feet, 7 inches of putts on Sunday after making more than 90 feet of putts in each of his first three rounds. Despite making the turn in two over for the day, Johnson was still only two off the lead with nine to play. But a bogey on the par-3 15th was the final dagger in his chances at a victory. Johnson is in the field for next week’s WGC-Dell Technologies Match Play at the Austin Country Club in Austin, Texas. He won the tournament in 2017 and owns six career WGC victories, second only to Tiger Woods’s 18.